After several years of sewing my neatly folded Ecumenical quilt top looking down from the hanger it was attached to, I decided that I wanted it finished. Not only did I want it finished - but I wanted it to be a usable functioning part of my bedding oeuvre. Not just merely functioning to keep a body from freezing in - but something I could use and be pleased to have created. 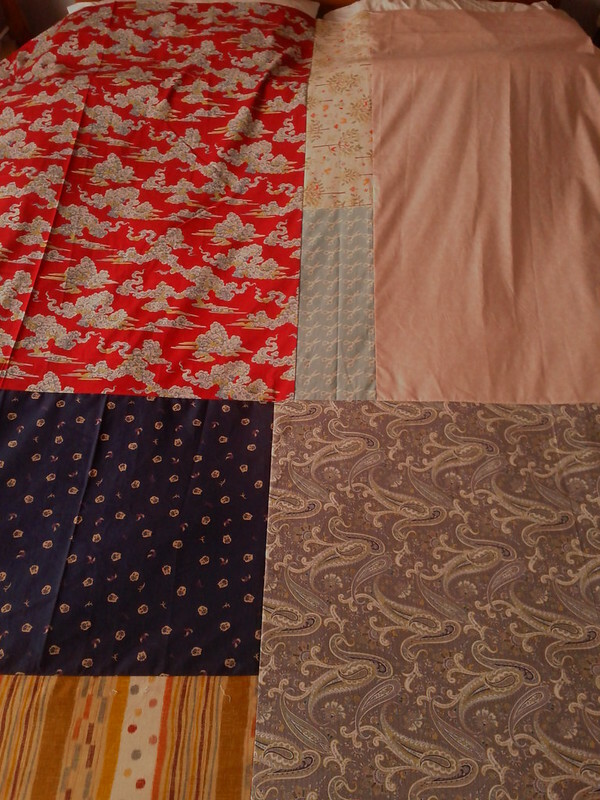 This pleasure in creating is always offset by how lacklustre my quilting is. Indeed the last quilt I tried to make ended up in a mangled heap in the bin - after it became too difficult to undo and redo. While ‘practise, practise, practise’ is always the way to improve, I feel like I want something that I can appreciate for its own merits, rather than appreciating from the perspective of someone assessing their learning process. To ameliorate the situation, I thought that I would try a quilting service. I whipped together a pieced back [see below in all its ‘weird colouring and odd lookingness of a cameraphone’ goodness] and I have sent it off to Maureen at Palm Beach Quilting to be finished. However, my measurements were a little off and Maureen needs to add a sliver to the edge to make everything work - she is going to use the Moda Dotti in silver. I hope this quilt is as wonderful as my mind has made it! * The double meaning for this only struck me as I typed it in … But I feel my frustration with the process probably vindicates this terrible pun! Not crazy quilting - but quilting that is crazy.